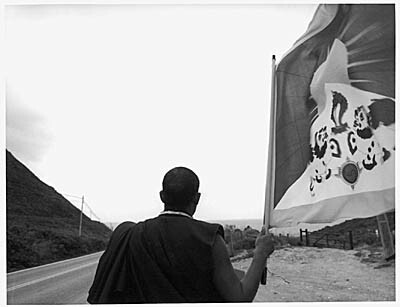 Project - "Road Map of Tibet"
April 2000 - spent two months to walk 525 miles from San Francisco to Los Angeles. The group of marchers was consisted by Tibetan monks, and nuns from India where they were granted political asylum. The cameras - a medium format, a 35mm, and a digital camera were on my shoulders during the whole walk. November 2003 - stayed one month at Dharamsala, India. I visited one of the nuns who walked at California, and tried to continue this documentary photography project, which started three years ago.